Part Used & Method for Pharmaceutical Preparations: The fungus and the carcass of the larvae of various insects are collected in the period of the Summer Solstice (tenth solar term). They are cleaned and dried in the sun or baked. 1. Deficient kidneys manifested as impotence, seminal emissions and soreness and pain in the lower back and knees. 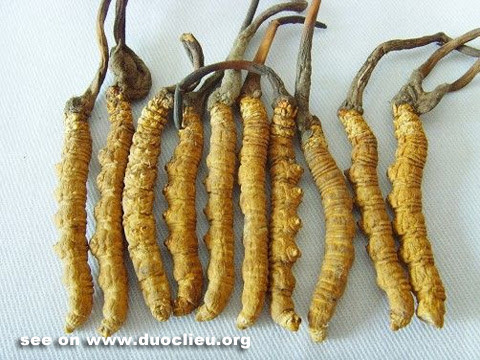 Cordyceps (Dongchongxiacao) is used with Dogwood fruit (Shanzhuyu), Dioscorea (Shanyao) and Dadder seed (Tusizi). The herb can also be used alone. 2. Chronic cough and asthma or cough with bloody sputum due to lung deficiency. Cordyceps (Dongchongxiacao) is used with Glehnia root (Shashen), Donkey hide gelatin (Ejiao) and Tendrilled fritillary bulb (Chuanbeimu). 3. Spontaneous sweating and aversion to cold due to weakness of the body or illness. Cordyceps (Dongchongxiacao) is cooked with chicken, duck or pork. Cautions & Contraindications: This substance should be used cautiously in cases with exterior syndromes.